I currently have a lot of time for being a little bit creative with food, especially with different breakfast options. When I’m working I usually don’t allow myself much time for a ‘proper’ breakfast which means I tend to grab a banana or eat something from work. I work in the catering industry so it’s easy for me to pick up a scone or similar. At the weekends, however, I like to cook up a nice late breakfast or brunch – this tends to be eggs, pancakes or french toast. 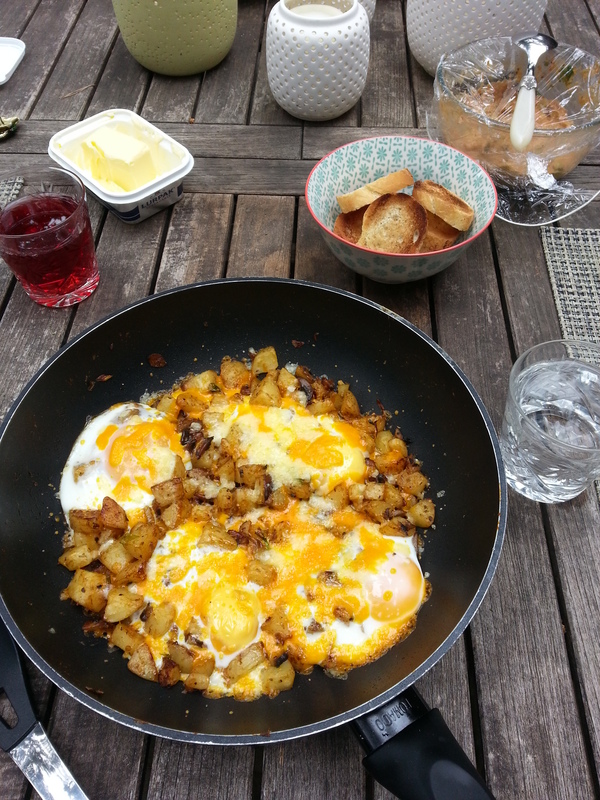 This weekend I decided on a mixture of Huevos Rancheros and a Southern American country-fried potato recipe. I used leftover potatoes from the dinner before (baby new potatoes). If you don’t have leftovers, I’m sure you can fry them from raw – otherwise boil them and wait for them to cool slightly before using them in this recipe. I haven’t thought of a name for this yet, but I do have a recipe. 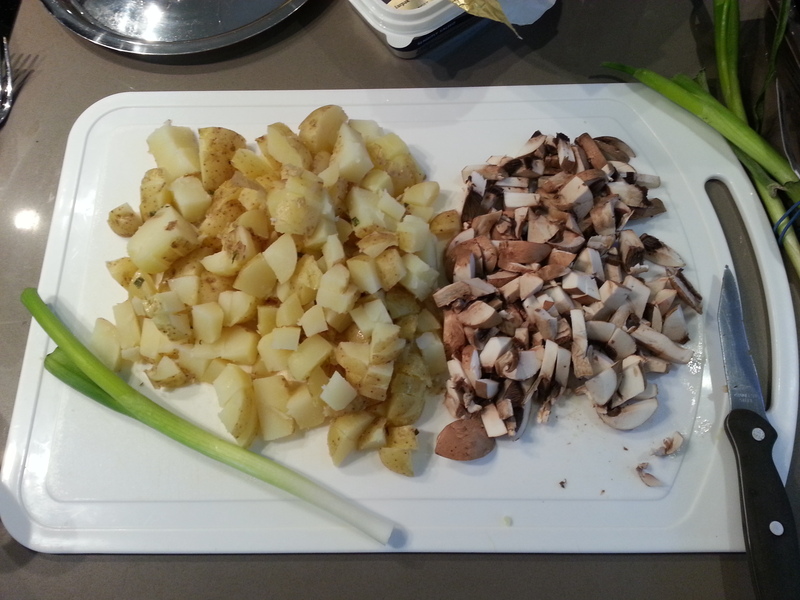 In a large frying pan over a medium-high heat melt the butter and sauté the potatoes and mushrooms for about 10 minutes – until the mushrooms are soft and the potatoes start to become crispy. Add in the spring onions and seasoning, allow to fry for 5 minutes Crack in the 4 eggs and allow to cook for a further 5 minutes. 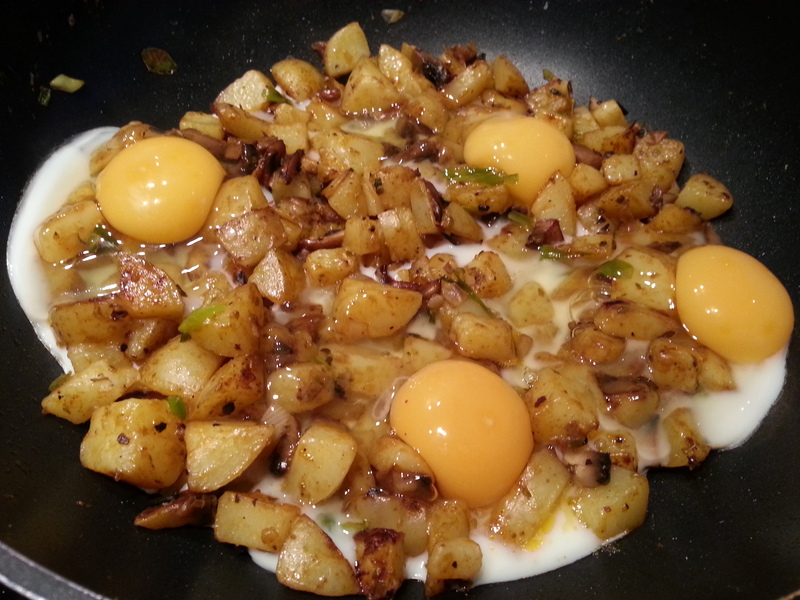 You can either put a lid on your pan or place your pan under the grill until the eggs are fully cooked through. Lastly, top with the grated cheese, making sure it fully melts. I served this with baguette toast and homemade guacamole (also a leftover from dinner the night before) and enjoyed eating this al fresco outside in the garden.